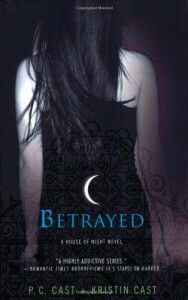 Betrayed (House of Night, #2) - P.C. and Kristin Cast - So many books, such little time. In the previous book, Zoey had been newly marked as a fledging vampyre and as she finds herself she knows that she has the helping hand of the goddess Nyx protecting and guiding her through these soon to be dark times. In Betrayed, Zoey truly understands the lesson Nyx is teaching that 'darkness does not always equate to evil, just as light does not always bring good.' Zoey struggles to balance three boyfriends, a death of a friend and her duty. Again like the first book I LOVED Betrayed. You get to follow the same characters further into the adventure of finding out the truth of the happenings at the House of Night. Even though this is the second time I'm reading this series of book, I am still being surprised and kept on the edge of my seat throughout the whole novel.